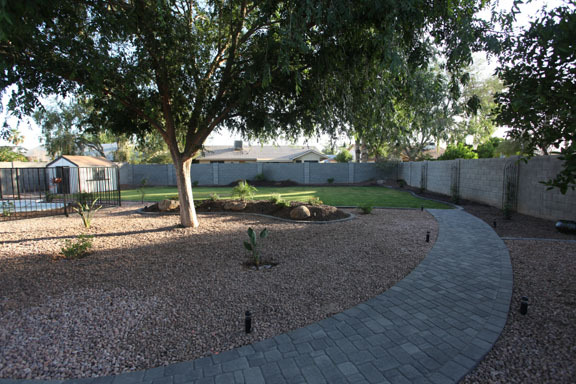 Where can you find the best paver patio designs in Arizona? 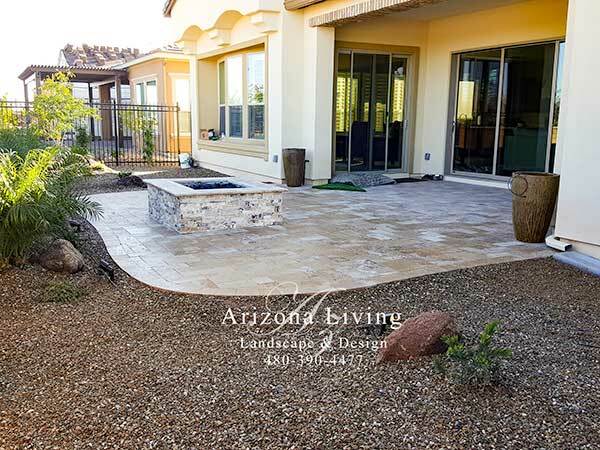 Look no further because Arizona Living Landscape and Design has been recognized as a leader in Arizona paver patio design and backyard paver ideas and installation. Don’t take our word for it, just ask our customers. 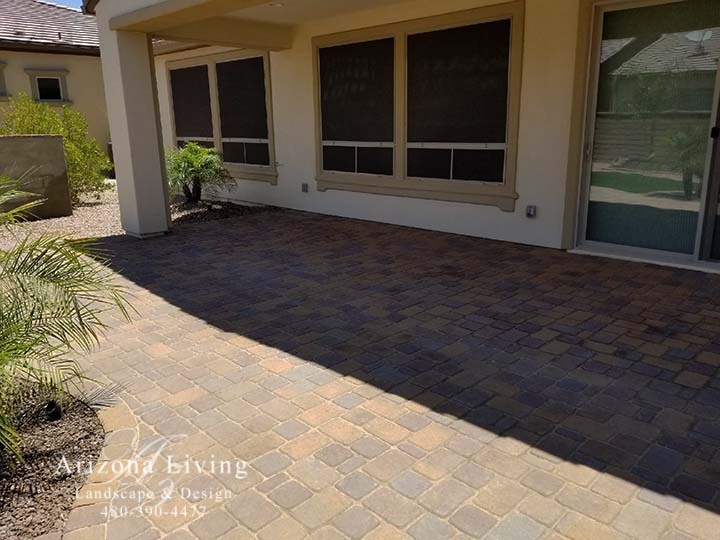 A new paver patio design with a landscape paver using Belgard Pavers, Travertine Pavers Arizona, Phoenix Pavers, or Pavestone Pavers can enhance a backyard landscape like nothing else. 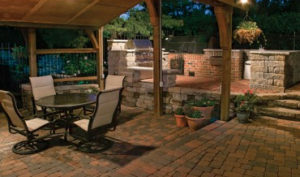 Patio pavers can be installed in small intimate settings or large areas connected with a walkway in your backyard landscape. 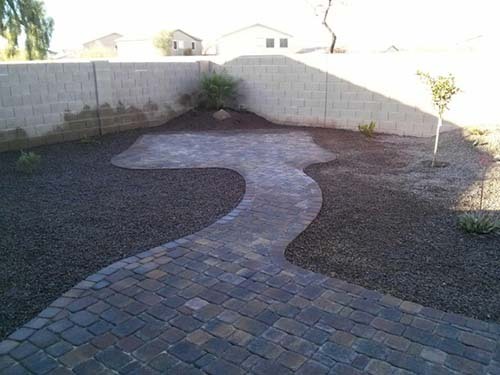 Your paver designs can be integrated into your landscape in a way that enhances the yard and is still affordable. Your new paver patio is an addition to your yard that you will not regret. 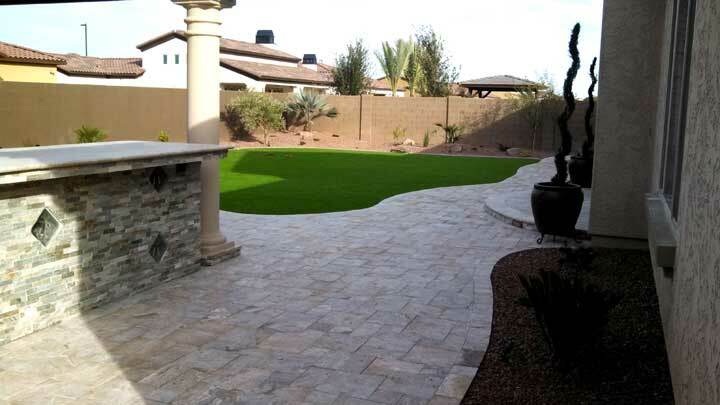 Here at Arizona Living Landscape, we install a variety of paver brands from Belgard Pavers, Cambridge, Phoenix Pavers, Pavestone Pavers, Travertine Pavers, any backyard paver in the Phoenix Arizona east valley, Chandler, Queen Creek, Mesa, Gilbert, Tempe, San Tan Valley, and Florence Anthem. 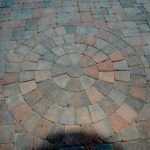 Take a look at some of our paver patio designs below for paver patio ideas and inspiration for your next landscape project. 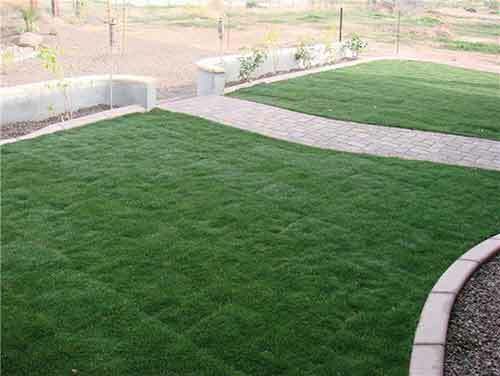 Then give us a call or click on the form to the right and we will be happy to work with you on your landscape design. What are you waiting for? 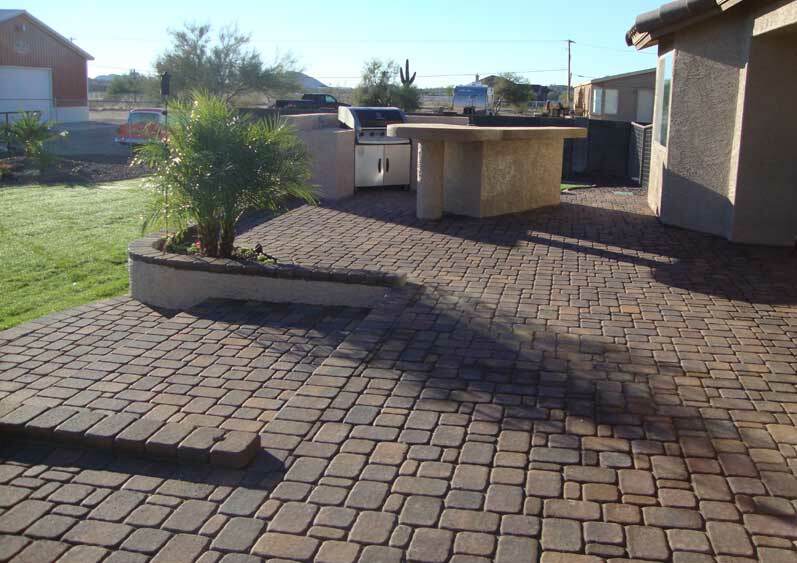 Give us a call today to help design around your paver patio ideas! 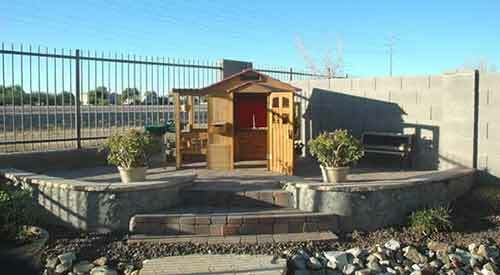 Arizona Living Landscape & Design 480-390-4477. 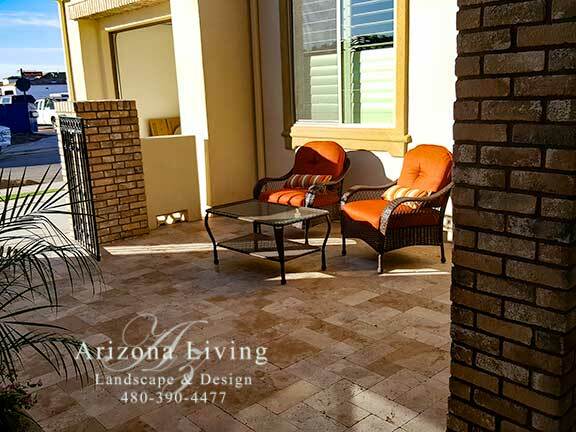 Front courtyard in Encanterra San Tan Valley, AZ with travertine pavers Phoenix. 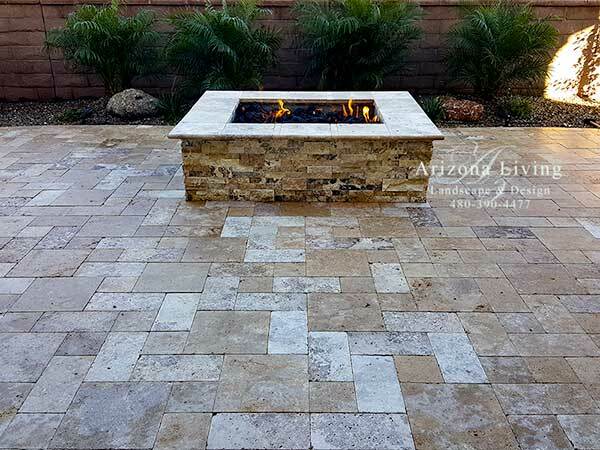 Backyard patio with Travertine Pavers Arizona and a gas firepit. 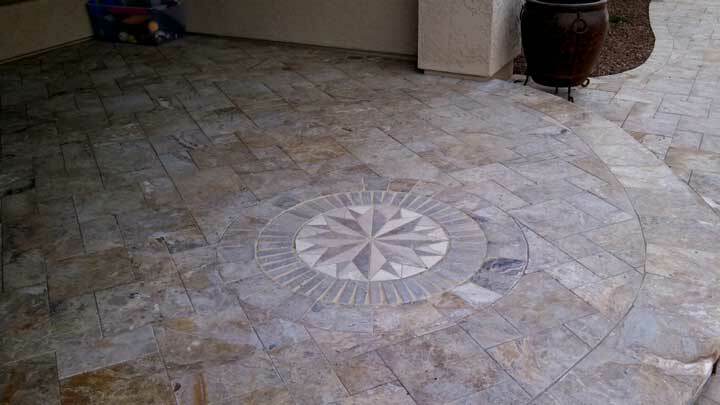 Paver patio design with Travertine Pavers and a gas firepit in backyard. 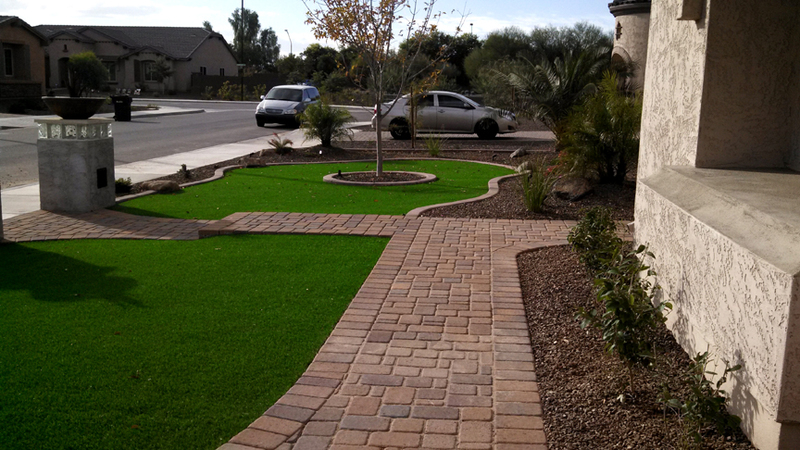 Phoenix Pavers sidewalk with synthetic grass in the front yard in Gilbert, AZ. 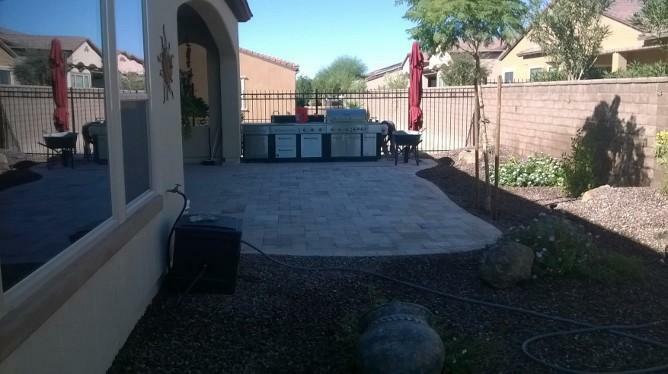 Backyard with outdoor kitchen in Gilbert, AZ and Travertine Pavers. 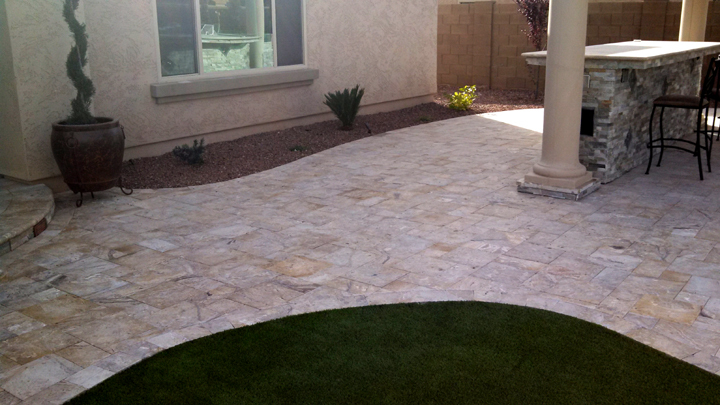 In Chandler, AZ we installed Travertine paver patio in 3 sizes in notcha color. 3pc. 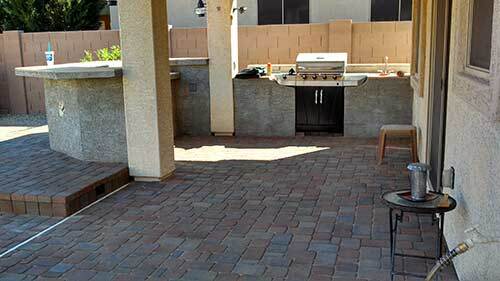 Pavestone paver patio in Queen Creek, AZ in Sierra Blend color with entertainment area Built-in BBQ and Bar. 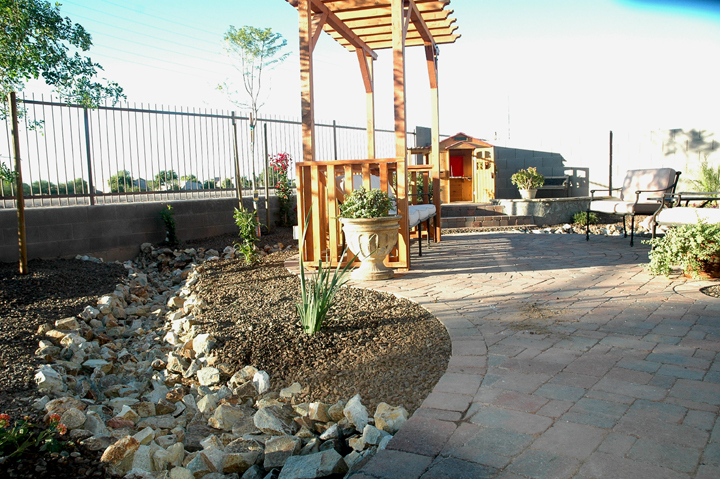 Paver steps from raised patio with planters in Queen Creek, AZ. Raised patio with steps, pony wall in block, outdoor kitchen with BBQ, and wood burning fire pit. 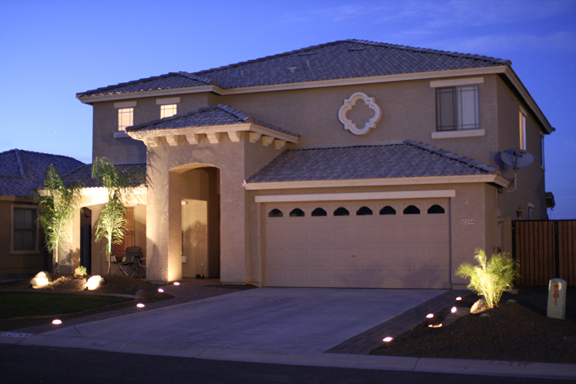 Phoenix Paver sidewalk in the front yard with steps and recessed lighting in Chandler, AZ. 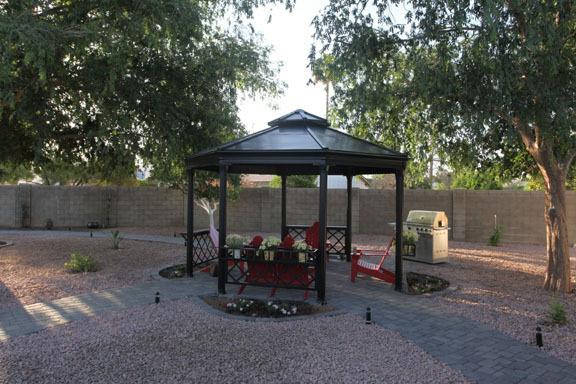 Cambridge paver patio with several sidewalks coming from different areas of the yard, a gazebo, and a BBQ pad for the grill. 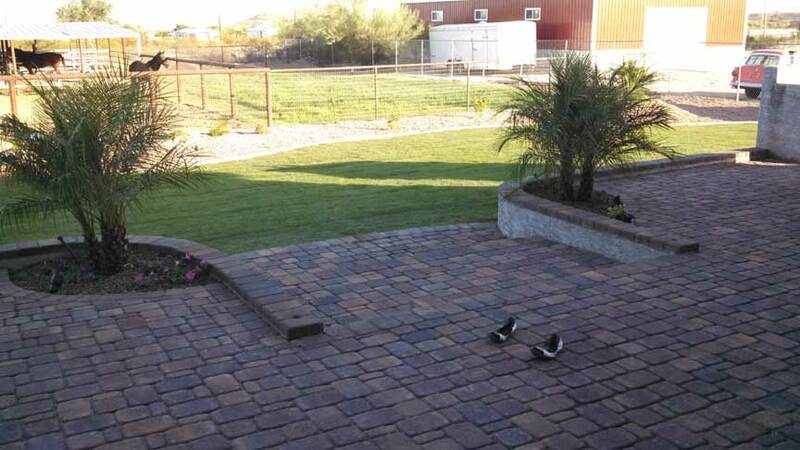 Backyard landscape design with sidewalks in gray colors. 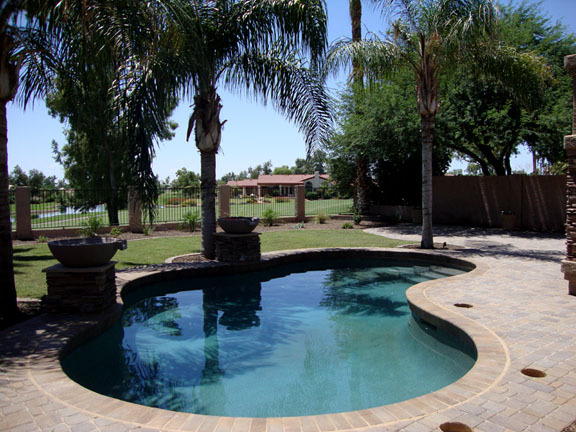 Paver patio ideas around pool with coping edge installed over existing cook decking in Chandler, AZ. 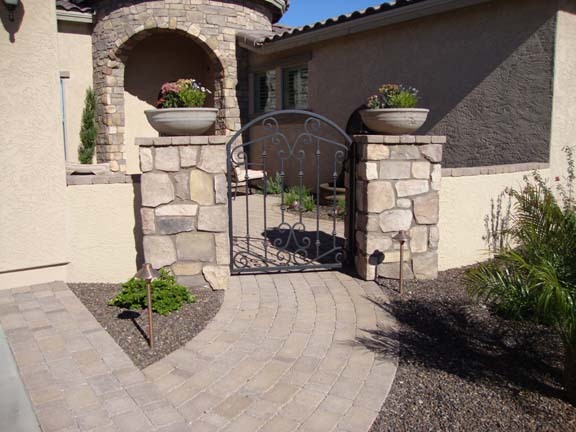 Front courtyard with patio entrance, driveway ribbons for extended area, sidewalk walkway, custom path gate, cultured stone and planters in Gilbert, AZ. in the Seville neighborhood. 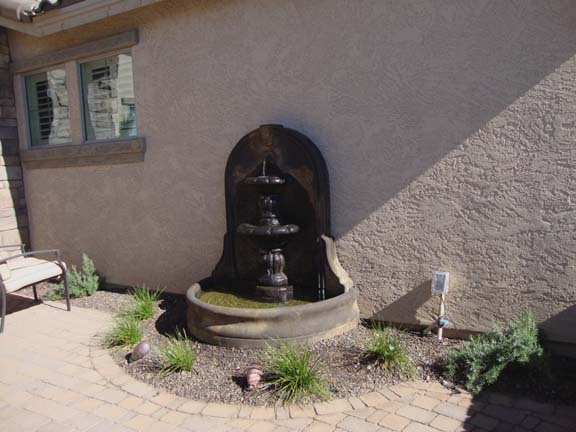 Front courtyard with fountain and patio installation in Seville Gilbert, AZ. 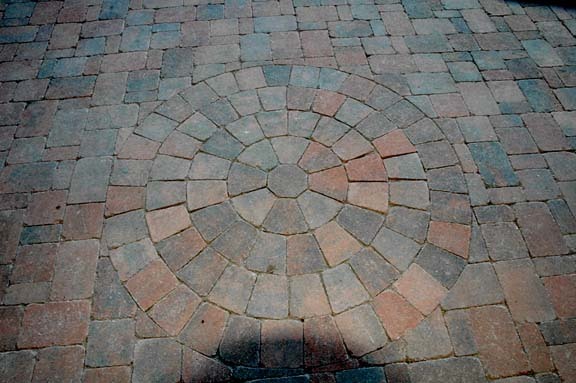 Another great paver patio idea is to integrate designs in the pavers. 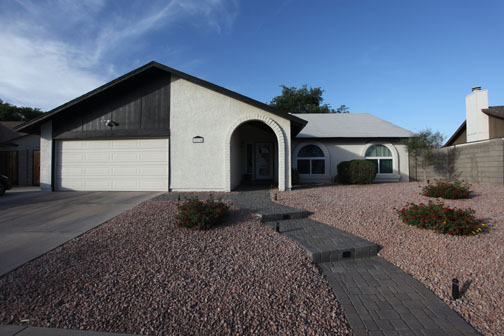 These are tumbled Cambridge pavers in the Dublin style in Bella color. Patio in 3pc. 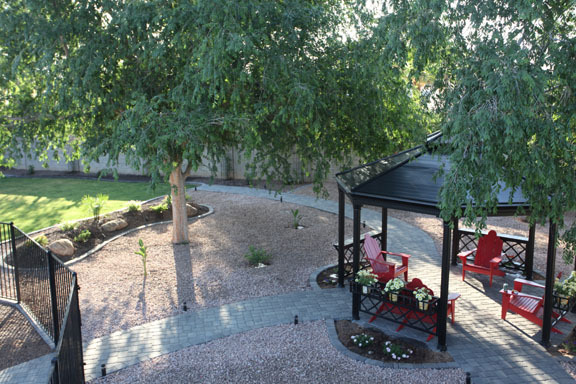 design with a sidewalk out to another pad for entertaining or fire pit. 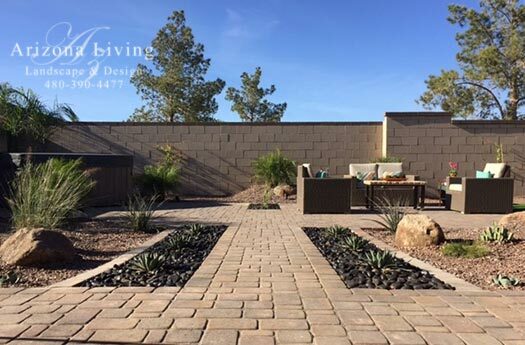 Above paver designs custom built and installed by Arizona Living Landscape and Design serving Phoenix east valley: Queen Creek, San Tan Valley, Gilbert, Mesa, Chandler, & Anthem Merrill Ranch.